A new tactic for both of tech enthusiasts and make up fans! 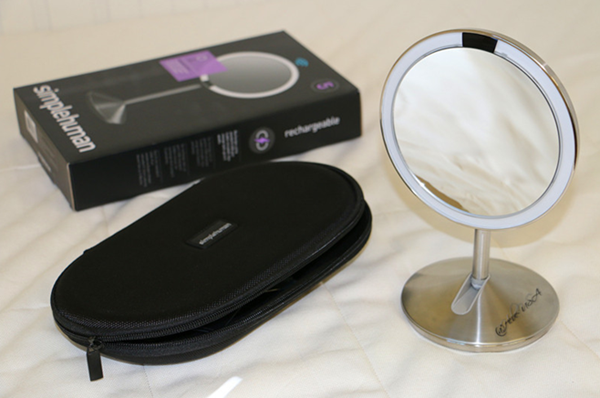 Simplehuman Sensor Mirror— an innovative and powerful tool that enhances your life experience. I did purchase a variety of mirrors from grocery and retail store, but now they are in my closet. The reason why I gave up on them is mainly because they became unclear while having the additional magnification . Therefore, a durable and functional mirror has been looked for. I found this mirror by chance, and I was quite impressed by those positive feedbacks about it. In general, I would not spend 1-200 bucks on a mirror. 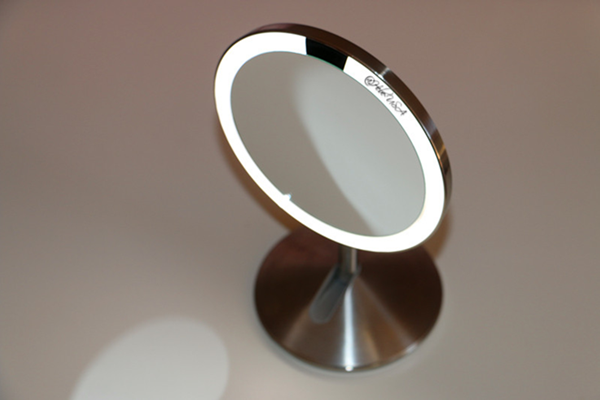 However, the curiosity beats me up and I ended up with getting the Simplehuman Mini Sensor Mirror, which was less pricy. Holy Grail! Now I have been using it for 2 weeks, and I am definitely happy with this purchase! In the first place, which is what I care the most as well, the magnification! This mirror is SUPER clear! It is so clear that you are able to see every pore on your face. Yes, at the same time, you will see all the blackheads on your nose and realize how serious your skin problems are. It is heartbreaking, but I personally do not mind seeing this because it reminds me of paying attention on my skincare routine—every second, every day. Apparently, you can see much better detail in this mirror and soon will get used to it. It can be a bit scary at the beginning, but once you put your efforts, you will feel grateful about the magnification it brings. Yippee! Technology! Charging: Use a standard USB port to recharge your mirror. You can charge it with your PC, laptop, even with your cellphone. It is safe and convenient. Light Bulbs: The LED lights on the side are incredibly long-lasting — Up to 40000 hours using is ensured. In other words, it can last over 100 years if you used it an hour daily. The mini one I got can last 2 weeks after each charging. 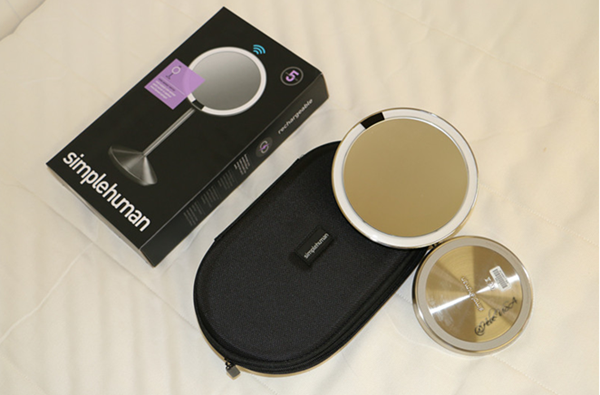 Mirror: Simplehuman has two versions of this mirror varying in the sizes. The big one can be adjusted to the angle and height, when the mini one is foldable. No more messy cords after charging. Put it anywhere you like. Switch：You can see the switch is on the back of the mirror through the picture. It is ON with the first touch. After that, it turns on automatically when you look into it and off when you walk away. 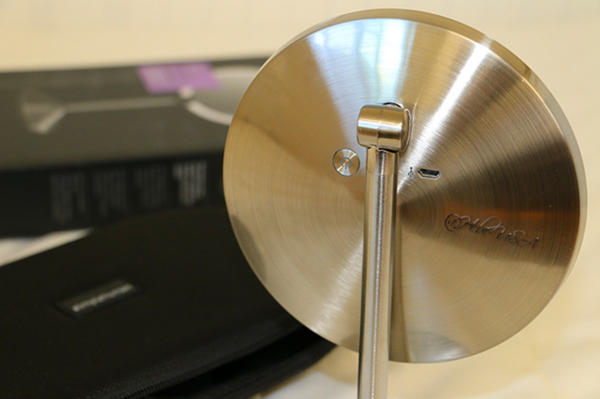 This decreases the chances to touch the mirror, which is easy to keep it clean! If you bought the mini one, I suggest turning it off while putting it back to the protective case. Otherwise it will keep lighting. Also strongly recommend this product to those people who have nearsightedness issue like me. I was struggling during the makeup application without having my eyeglasses on. Such a great idea! In terms of the drawbacks, I found the on off sensor being a little annoying because it is way too smart (lol) sometimes. It would turn off every time I looked away to search something nearby. This disturbs me a bit after it constantly on and off in a short amount of time. It could be solved by adding a button that keeps it continuously illuminated. For the function, it could be improved in the consideration of being a normal mirror when you do not want the magnification anymore. Ha-ha, I know I am a little demanding. Anyway, I am happy with my Simplehuman Sensor Mirror overall and satisfied with the results it brought to my precise makeup. Feel like it can last FOREVER unless you break it (hopefully not)! Worth every penny you spent. I think I will get a bigger one for home and save the mini for travelling. Let me know if you have any problem, and feel free to leave a comment under this post.